Beirut im Frühling 2019 mit neuem Album auf Deutschlandtour Am 1. Februar 2019 ist es soweit: Beirut veröffentlicht sein fünftes Album mit dem Namen Gallopoli. Bereits mit 15 Jahren nahm Zach Condon sein erstes A lbum auf. Nach langen Reisen in Europa, besonders im Osten, erregte er 2006 mit seinem Album Gulag Orkestar großes Aufsehen: Russische Polka gemischt mit melodischen Pop dazu osteuropäische Klänge, brachten einen bisher einzigartigen Sound hervor. Auf seiner alten, elektronischen Orgel der italienischen Marke Farfisa, mit welcher er seine ersten beiden Alben G ulag Orkestar (2006) und The Flying Club Cup (2007) ebenfalls komponierte , begann Zach sein neues Album im Winter 2016 zu produzieren. Zach Condon, the mastermind behind Beirut, shares new song and music video for "Landslide." The video, starring Game of Thrones' Ian Beattie, is directed by Eoin Glaisterand shot in Kazakhstan. 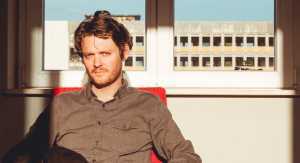 The song is off Beirut's fifth studio album Gallipoli out February 1st. The 12-track Gallipoli started life in the winter of 2016, with Condon returning to his old Farfisa organ, the same one used to write the first two Beirut albums (2006's Gulag Orkestar and the following year's The Flying Club Cup), which he inherited from a traveling circus when he was a teenager. Following recording stints in New York and Berlin (where he now calls home), Condon settled in Sudestudio, a studio complex deep in rural Puglia, southern Italy. It was here that he rediscovered the old joys of music as a visceral experience which became the founding principle for Gallipoli. To celebrate the release of Gallipoli, Beirut will play headline shows throughout North America, beginning February 10th in NYC, and the UK and Europe. Tickets on sale now at beirutband.com.